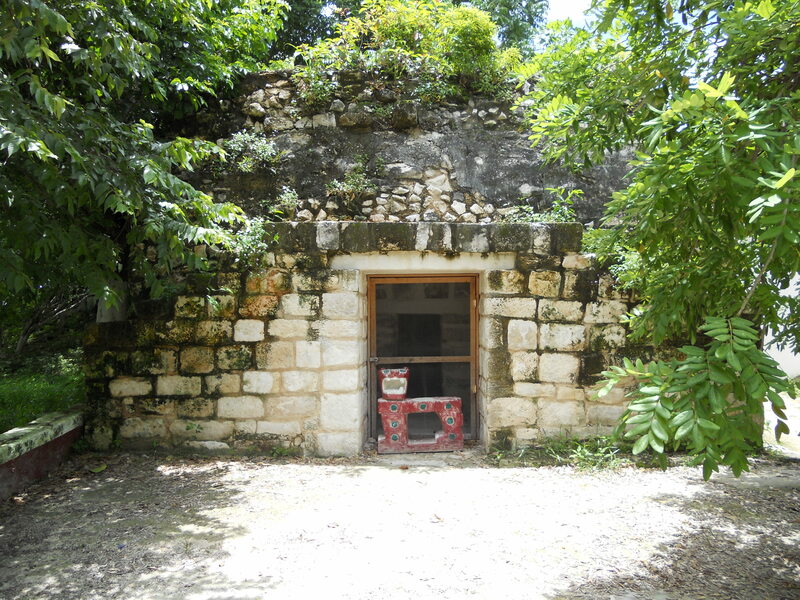 Don’t miss it.. a chance to view the World’s Smallest Mayan Ruins! I’ll preface today’s entry by saying it’s been a good day thus far. Managed to get a little sleep, The Management has returned from a week up in The Jerz and the iPhone 4 has landed. Let’s pay a quick visit to the weekend before we head back to Cozumel. I started the weekend project list by removing all the fixtures from the downstairs bathroom and ripping up the linoleum. There was a heinous pink stain on the linoleum. I’m not sire what the root cause of said stain was, but it predated our arrival. My intention was to replace the linoleum with some very chic ceramic tile and all that rot. I spent Friday installing backerboard and getting things ready for Saturday when I intended to do the tiling. I thought, set the tile on Saturday, grout on Sunday, back in business on Tuesday. Ambitious, yes, but I didn’t think it would come down to an epic fail. Boy, was I wrong. You see, third shift reared its ugly head again. I should never attempt a project of that scale on little to no sleep. As I had mortar on my freshly painted walls, squeezing through the tiles and making an all-around nuisance of itself, I had a little bit of a breakdown. I have a little problem with failure, have had it for years. I don’t want to go into root causes at this time, but it can be crippling at times. I sat back and wept. Because I failed, because I wasted a lot of money on tools and material. I reached out for some support, but was rebuffed, which didn’t help my mood any. I did what any self-respecting guy would do. I tore out all I had done and went to Carpet Mart for a linoleum remnant. And somebody to put it in. That was done on Sunday evening and I’m currently working on getting the plumbing back together. Anyway, back to Cozumel. As many of you I had spoken to know, The Management and I had no definitive plans for Cozumel, assuming that it would be a day to hang out on the ship and relax. The night before, in the bar (big surprise), Fred was expounding on his shore excursion, which was an island tour with beach time. I suggested to Management that it might be fun, and she half-consciously agreed, so I went to the shore desk and signed us up on the tour, joining Fred and his family, as well as the Colorado Sisters. We went ashore, passing a store calling itself “Drugs and Deli” (I am not making this up) and met up with our tour guide, Miguel. Now, I could be way off on this, but Miguel looked like Nicaraguan president Daniel Ortega. For the record, Drugs and Deli wasn’t that great. I ordered a Reuben with a side of Vicodin. No dice. Off we went on our air-conditioned coach. Our first stop was to a lovely stretch of secluded beach. As it turns out, the island of Cozumel is very underdeveloped, compared to Cancun and other well-known resort areas. Much of the beaches are off-limits to protect the sea turtles. You will see small vertical sticks in the ground showing where turtle nests are located. There were a few shops along this beach where you could buy bongs, serape and coconuts. Very beautiful stretch of beach, primarily made up of crushed coral. After that, it was off to the World’s Smallest Mayan Ruins! I’m not one to judge, but this place was pretty small for a temple. Must’ve been dedicated to the really unpopular god, because I’m pretty sure I’ve seen dog houses in Manheim Township that were bigger than this temple. Of course, there was the obligatory lecture on buying black coral from the one guy who will treat you honestly. I’m pretty sure that Miguel was getting a kickback, though. The prices weren’t that great. Following the visit to The World’s Smallest Mayan Ruins! we proceeded on to some private beach where we had a grand total of about 45 minutes and that included time for a hideously overpriced Mexican buffet that would’ve sent any TexMex snob running to Taco Bell. I think the technical term for a place like this is “tourist trap” but I could be wrong. The Management and I, as well as the Colorado Sisters did not have time to change to go in the water, so we settled for getting in up to our knees and watching Fred and his family have fun in the surf. The water is amazing…. so very clear, even in the harbor we could see the bottoms of the ship’s rudders. After our brief experience, we went back to the ship and got ready for a delicious dinner that included a wonderful capreze salad, scallop risotto that Unibrow Jeffrey kept bringing plates of to the table, and also the best chicken marsala I ever had. That’s enough for today… I’m going to talk about our slightly damp experience in Key West during the next post. Until then! Cozumel sounds heavenly, where heavenly = “somewhere I could go hide if I don’t manage to find a job soon”. I often have to Google the names you use in your posts – I’m sadly lacking in cultural references… I also don’t want to play devil’s advocate (well…) but I think you should assess the whole tiling thing, and give it another go later on when you’ve had some time to mull it over. Perhaps? Maybe? Slightly Damp at Key West ?? !! Have you seen my FB Video of a bunch of dumb tourists @ the Southernmost Point?? It’s an honor just to be a part of the competition… really.